Artificial refrigeration was demonstrated by the inventor William Cullen in 1748, but it was not until 1805 that William Cullen introduced the first reliable model. Even then, refrigeration long remained the preserve of specialised industry, and it was not until the 20th century that it became part of people's lives at home. 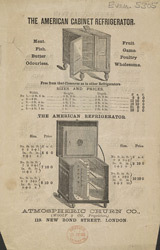 The cabinet refrigerator shown here is a representative model from the end of the 19th century. Such refrigerators were not electrically powered, and so could not create ice from water as do their modern counterparts. Owners of these refrigerators would sometimes have a daily delivery of ice from a central depot, or employ separate ice making machines. The refrigerator itself was essentially a sturdy wooden box lined with zinc or slate, finished with a wall of cork or charcoal to stem rises in temperature.